Did you know that you are given two opportunities to help you on your PT exam? They are the laminated sheets or whiteboards that the Prometric Testing Center provides you. Take advantage of them to help you clear your mind so that you can focus on the NPTE. This helps you to release any extra information in your brain so that you don’t have to worry about remembering everything or worry about pulling out the information during the exam. Before answering any questions, take a moment to write down information. This can help you reduce those feelings of anxiety. Utilizing this time before the exam allows you to get into the NPTE mindset and have you be ready to focus on what’s going to be presented to you. While you are taking the exam, utilize the laminated sheets/whiteboards to help you focus on what’s important on the exam. 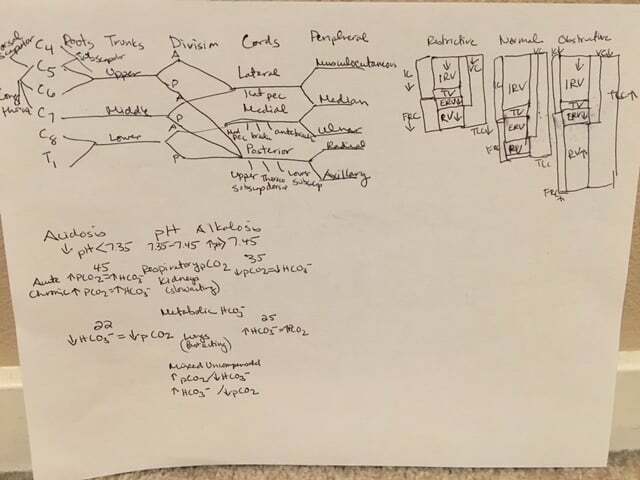 How Should I Use Brain Dumps to Help Me for the NPTE? One of the laminated sheets/whiteboards, you’ll want to use as your brain dump. Think of this as a one-page “cheat sheet” or “cliff notes.” The information that you put down relieves you from having to keep the knowledge in your brain. Writing the information down allows you to clear your mind in order to focus on what the question and answers are asking you. This brain dump sheet should focus on areas that can trip you up as well as your weaker concepts. You’ll want to write down aspects that you feel comfortable about that have multiple components and can be easily referenced during the national physical therapy exam to avoid making mistakes such as the brachial plexus. Just before starting the PT exam, this is not the time to figure out how or what to put down on a brain dump sheet. 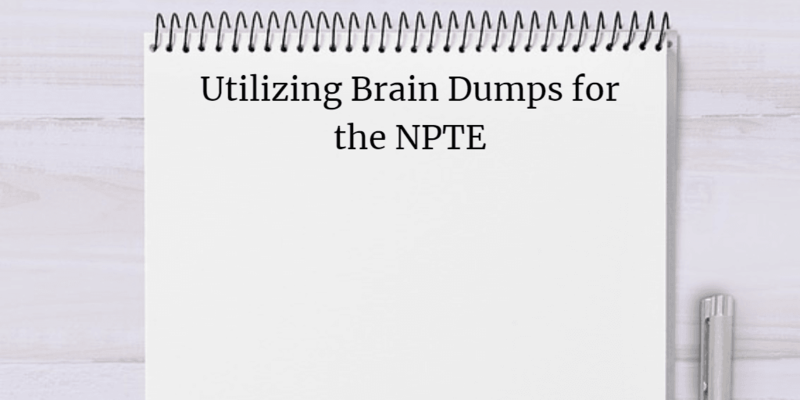 If you haven’t done a brain dump prior to the day, this is not the time to figure out what to write down when you sit for the NPTE. This would only create anxiety and the point of this exercise is to reduce that feeling. The time to figure out what to write down is beforehand and preferably you would have already used them with practice exams. That way they are tweaked to what you feel would be important and helpful on the NPTE. The other laminated sheet/whiteboard, you’ll want to use to take notes or help you answer the multiple choice question. This will start off as blank and could be used when you need to figure out what the question or answer is asking by writing down related keywords, drawing out what is being asked or other helpful information. This will help you narrow the material down and let you focus on what you need to guide you to the correct answer. One of the ways to reduce making mistakes is to utilize the test taking strategy of “True or False” with the answer choices. This method helps you reduce overanalyzing and is especially helpful with answers that have multiple components in them. By implementing this strategy, you can reduce the chance of going back and forth on an answer and choosing the wrong option. What are Some Examples to Put on a Brain Dump? “Breathe” – we tend to hold our breaths when we are tensed and it’s a reminder so that we can maintain giving our brains the needed oxygen to focus (as well as to decrease the likelihood of headaches). A keyword to help you refocus – it could be “Focus”. The point is when you are finding yourself getting anxious this keyword can help you get back into the zone and answering questions without losing too much time. An encouraging phrase – ”You Got This” is an example to help you get through the exam and use as your own personal cheerleader and motivation. A predetermined answer to go to when stuck – this is a test-taking strategy to avoid having to think about it and is useful when the time is running out. When Can You Write Down Information? You can begin writing down information on these laminated sheets/whiteboards AFTER you have started the tutorial section. This allows you 15 minutes to organize your brain and jot down information prior to starting the exam. What if I’m Told I Can’t Write Down Anything Beforehand? Even though you are allowed to write down information during the tutorial section, don’t be thrown off if the overseer at Prometric Testing Center stops you. Being told “you can’t do that” shouldn’t rattle you. Don’t argue or say “But I was told I could do that”. Just shrug it off, take a deep breath and let the circumstance be. Expect the unexpected and you’ll be fine. If this happens, just allocate 5-10 minutes to still go through the process of creating the brain dump and setting yourself up to take the exam. Don’t worry about the time; you’ll save yourself time in the long run by using the initial few minutes in this way before you begin. Remember the goal is to help you. If you think about the lost time, you’ve already lost to the exam with your focus gone. To report to the FSBPT about not being able to write during the tutorial exam, use the feedback survey to let them know. So, what can you do if you were told you couldn’t write things down during the tutorial section? At the end of your exam, you’ll be presented an exit survey. It’s mainly about the experience of the Prometric Testing Center. If you were told you couldn’t write things down during the tutorial section, this is the place to let FSBPT know. That way for the next exam, it can be corrected. You won’t have outside help to guide you toward passing the physical therapy exam NPTE. However, by taking the time to write down information on the laminated sheets/whiteboards as your NPTE helper sheets, you are giving yourself an edge to do well. Remember, they are there to help you refocus and allow yourself to remember concepts without clouding your mind. The best scenario is that you write things down and you don’t have to use them; but if you do, you’ll have something to reference and help you get those extra points.